Due to the noise of a global business environment most trainers face the challenge of not only creating great content, but of extending the reach and accessibility of their information to trainees. 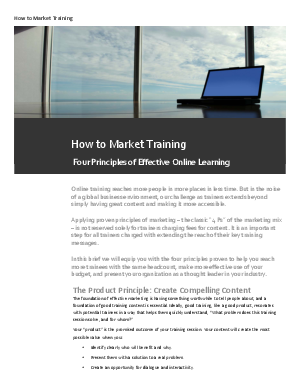 In this free white paper, Citrix applies the "4 P's" of marketing and shows how easy it is to reach more trainees with the same headcount and budget, all the while showcasing your company as a thought leader within your industry. Download now to learn more.